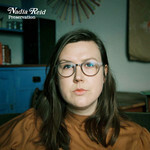 An ode to self-reflection and self-betterment, Nadia Reid's 'Preservation' is the sound of Nadia showing her true colours, taking back a bit of power, and learning more about herself. Deeply intellectual but felt by all, it punches harder than before. Nadia's beautifully warm vocals coolly wrap around feelings of turbulence, and exude a gently improved confidence.